Want to know why? Because, among many other things, I have found myself able to perform in so many different venues and styles here. 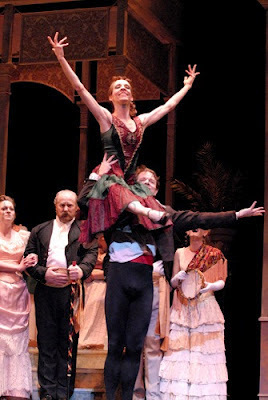 Not only am I blessed to be part of a ballet company that performs several different styles (including classical ballet, which I have trained in for many years), but I have had the good fortune to explore other types of theater and performance types as well. I have been able to take voice lessons for a couple years now, and gotten to perform in several different theater (musical theater, straight theater, and opera) productions since we moved here in 2008. And now, I venture into another very particular genre of performance: 80's Hollywood dance. Can you say, Patrick Swayze and Jennifer Grey? 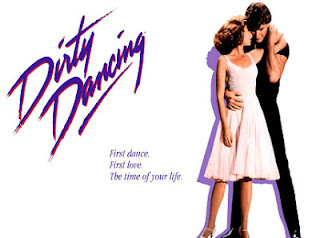 As a pre-teen and teen, I watched "Dirty Dancing" over and over. As a dancer I oohed and ahhhed over Patrick Swayze's double tour, the swan lift, his ability to make the music come alive with his body movements, and over the dance sequences that popped with energy out of the screen into my cousins' living room. I realized even back then that dancing was essential to my life and nothing could excite me more than a good story accented by amazing dance sequences. Never could have predicted this, but I have been given the opportunity to perform "The Time of My Life" dance sequence at "Backstage to Hollywood: A Night at the Movies" this Labor Day weekend. You know the scene. It's the one at the end of the movie where Patrick Swayze busts in at the end of summer talent show, and grabs Baby ("No one puts Baby in a corner") and the mic. He then announces he is doing the end of season dance and declares his love for her in front of everyone. Pretty sure every woman watching, pre-teen or not, sighed at this declaration of love and then cheered Baby on as she performed the dance she worked so hard on-- despite the extreme poofiness of her hair (which didn't seem that poofy in the eighties, now did it???). I am excited to bring the feel of this iconic movie and scene to this fun variety show in Breckenridge, Colorado this weekend. 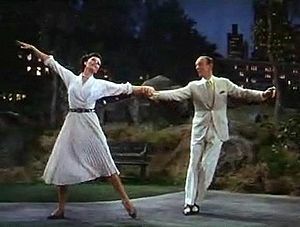 I also am humbled to say my dance partner Peter and I will be performing the iconic "Dancing in the Dark" originally danced by the amazing Fred Astaire and the lovely Cyd Charisse in "The Band Wagon" (circa 1953). This stuff is harder than it looks, folks. These people were uber famous for a reason. They make it look easy and beautiful. I hope to do it justice this weekend. 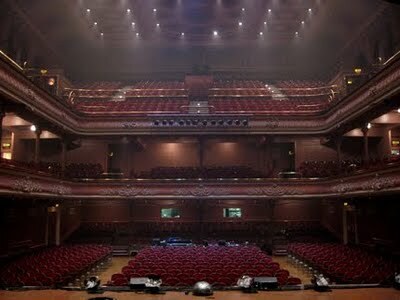 Pictured above is a random empty theater hall. What shall we fill up this big, cavernous space with? That's what I'd thought too. Until this spring. I was privileged to dance in "La Traviata" in Colorado Springs with Opera Theatre of the Rockies. Pikes Peak Center was bigger than most theaters I'd ever performed in. It was also my first time in an opera. I was deeply touched and impacted by the amount of talent and hard work I experienced while hanging out with these vocalists. 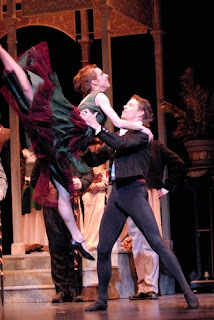 Ironically, they in turn acted like the dancing my partner and I did was beyond their highest expectations-- my confidence as a performer skyrocketed due to the appreciation and many compliments I was given during this run. The biggest lesson I learned during "La Traviata," however, was an important one. Here's what I found the first time I stepped onstage, and realized how large the space was (and, at that point, filled with what seemed like a million empty seats in front of me): In order to make any type of impression on our soon to be audiences, I was going to have to increase my stage energy and "power" tenfold. Having been a performer since age eight, I have learned intrinsically that your personal space must swell out to include every single person in every single seat, all the way out to the back row of the balcony. If your gestures and body language choices do not translate out to the back wall, your performance becomes obsolete. No one will understand your character, intentions, or emotions unless they are sitting in the front row. Simple facial expressions aren't even enough. Standing out on that stage for the first time, I was scared. How could I fill that huge theater space with the energy it demanded? I had no choice. For a minute, I let myself feel the fear the great cavern in front of me evoked, and think thoughts of not being able to touch every single audience member. Then I prayed. Then, it was Peter's and my turn to rehearse our part for the party scene of the opera. I forced myself to hurl, cast, and throw my dancing and acting energy out to the back of the balcony, far more forcefully than I ever have done in the smaller theaters I'd previously performed in. Not done in a ridiculous, fling-y way-- but in a way that simply opened up the center of my soul and tossed it outward, through my body movement, more potently then normal. My goal was to fill that theater hall top to bottom. What I learned was that I was enough. What I learned was that the energy I tossed out in performance was not too puny or small to reach the back row. The God-given power I flung out from the center of my heart and soul took much energy, but the result was I realized I could do it. Isn't life kind of like the cavernous space in that theater? I want to fill the moments of my life with similar energy and focus. I want to reach the "back row" of my life with love, passion, and meaning. What "La Traviata" taught me (as well as good opera is heart-breakingly beautiful) is that there is no coasting allowed-- if you want the theater, or your life to be filled.